Fall Print Sale is Here! BONUS – Mounting and Texturing on Sale Too! 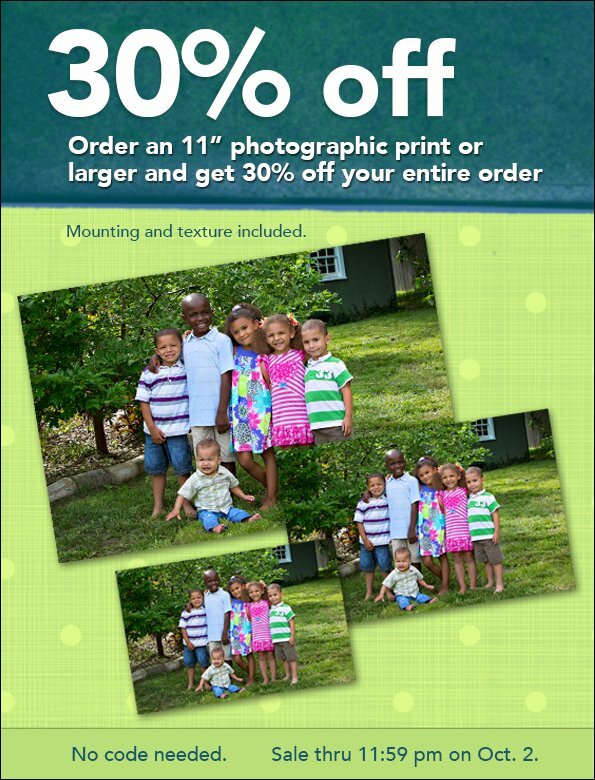 Stock up on Photographic Prints of ALL sizes during this incredible sale on luster and metallic prints. We’ve sweetened the deal by including popular finishing options as well. Artboard, Standout Mounts, Foamboard, Styrene, textureÂ options and lacquer coating are all included. How do you qualify for this 30% off sale? Â Simple. At least one print in your order has to have a dimension of 11″ or longer. That’s it. Order 200 4×6 Prints, 40 Border Wallets and a 10×20 Metallic Print – BAM! 30% off the whole order! Order a 16×24 Print with Irish Linen Texture on a Standout Mount – BAM! 30% off the whole order! Details:Â Photographic Prints are defined as being printed on Kodak Endura Pro paper with either the Luster or Metallic finish.Â Textures include Pebble, Irish Linen and Canvas varieties. Also included are Photographic Greeting Cards on luster or metallic papers, Dry Erase Boards, Border Wallets, Photographic Preview Booklets and Swatch Kits. Standout Mounts, Artboard, Foamboard, Stryene and Lacquer Coating are included for photographic prints only. These items can all be found inside the Photographic Products catalog of our Black River Imaging – ROES software. Framing Services and Albums are not included. No code is necessary. The entire order will be discounted 30% at billing with the inclusion of a minimum of 1 print with a dimension of 11 inches or longer. Your email confirmation will show the adjusted price. The sale applies to orders placed on September 25th through 11:59pm on October 2nd, 2013. Discounts cannot be combined with other promo codes or offers. Free Shipping is only available on orders of $15 or higher. Due to the popularity of this sale, normal 2-3 day turnaround times for these items cannot be gauranteed.